It's slugs and snails and puppy dog tails this week, with Mr Whippy, and Alexei Sayle on his bike. 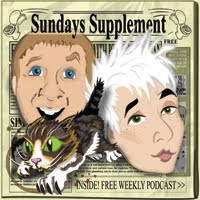 It's the Star versus the Express this week, so we talk about everything except the supplements. This week we're joined by the fantastic Sarah Millican. We're 2 years old today. Please leave your presents on the doorstep. A Saturday Special. Now with added Ninjas.